The 64th edition of London Fashion Week featured 83 designers showcasing Spring/Summer 2017 collections, and a further 150 brands showcasing in Brewer Street car park’s Designer Showrooms. A car park seems an odd venue for one of the ‘big four’ global fashion weeks, but it is not so unusual for the London instalment, which was born in a West London car park back in 1984. Since then, the event has grown to welcome guests from over 58 countries and generate orders of more than £100m each season. 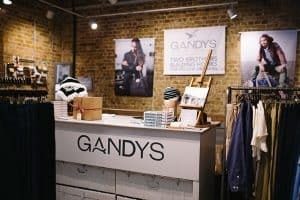 It’s vital in promoting British fashion to an international audience of buyers, press and consumers; and with ready-to-wear womenswear sales predicted to grow 23% (from £27billion in 2015 to £32bn in 2020) it is not an occasion to be brushed off as ‘a lot of people wearing crazy clothes’. In a post-Brexit Britain, London Fashion Week deserves special attention as a leading authority in an international industry, equally competing for attention and holding its own against the continental fashion hubs, Paris and Milan, as it does with New York. So what should you know about London Fashion Week SS17? Here are a few key highlights to get up to speed. The opening show is a prize position, and usually allocated to one of the city’s rising talents. This season it was the turn of Teatum Jones, designed by Catherine Teatum and Rob Jones, who have gained worldwide acclaim this year as winners of The Woolmark Company’s prestigious International Woolmark Prize. The designers are well-known for their love of human stories and this season was no certainly exception. The show opened with a mosaic of screens running interview footage of young Scots discussing their thoughts on the creativity and openness of Scottish society. Sound bites, such as “we celebrate our differences”, overlaid a pulsing beat as the models hit the runway. The interpretation into the collection was subtle (no kilts, thank you); prints inspired by the paintings of Scottish art and colourist Charles Rennie Mackintosh, and geometric patterns with splashes of vibrant colour and jewel tones inspired by the Glasgow rave scene. For the first time, Teatum Jones presented menswear alongside womenswear, and with a multitude of textile developments, fabric choices and colour palettes the collection was brought together by a single concept: a celebration of diversity and difference. And if we needed any more convincing, the designers appeared for the finale bearing the slogans #Londonisopen and #Scotlandisopen across black T-shirts. Sadiq should be happy to have such unabashed supporters of his campaign. London’s boy wonder, Christopher Kane, sees his label turn 10 this year. Live-streamed for the first time, Kane’s SS17 collection took inspiration from “that feeling of ‘make-do and mend’” laying ‘road kill’ furs (his words not mine!) over haphazard stitch patterns and prints of marble, leopard and collaged memorabilia. The show stealer however, was his collaboration with Crocs footwear. Naturally, the social media sphere exploded with confusion, and a healthy dose (in my opinion) of downright outrage: Crocs on the catwalk? Quelle horreur! We might see some crazy things at London Fashion Week, but this is just one step too far. Of course, the other household name on everyone’s lips was Burberry. Events will run until 27 September and include silk-screen printing demonstrations, visible mending workshops, and bookbinding classes. Back in 1986, in London Fashion Week’s early years, Drapers wrote: “When the British do young, innovative fashion, they often do it best.” This statement still rings true today. Each major fashion week has its strengths, and London has always been a melting pot of new and exciting talent. 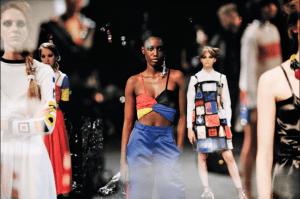 The British Fashion Council and Topshop’s Newgen scheme, now in its 23rd year, provides young British talent an introductory platform to the international industry. Recipients this season were Ashley Williams, Molly Goddard, Ryan LO, Faustian Steinmetz, Marta Jakubowski, Paula Knorr and Sadie Williams. New to the catwalk, Molly Goddard was a particularly hot ticket. Known best for her hand-craft techniques, nostalgic inspirations, and a staple use of tulle, this season Goddard also made use of patchwork, smocked micro-gingham, fluorescent colours and asymmetric styles. As at Teatum Jones, rave culture permeated the mood, with Goddard’s models remaining on stage to dance trance-like under revolving spotlights. The trend of ‘going green and slowing down’ is definitely here to stay, but it’s not an easy feat when it comes to fashion. To offer the consumer-expected prices, on time and of acceptable quality, fashion companies battle with ever-complex supply chain systems. This season H&M teamed up with London College of Fashion to explore the concept of ‘designing for sustainability’ and increase awareness of a multitude of issues, from potential environmental pollution and hazards created by discarded clothing, to zero-waste concepts and recycled textile techniques. Thirty-three teams of students were challenged with ‘upcycling’ garments and materials sourced from H&M’s in-store garment collection scheme (since its launch in 2013 the company has received more than 22,000 tonnes worth of clothes) to create womenswear capsule collections. 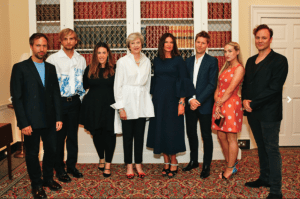 Speaking of politics: Thursday evening saw Theresa May continue the tradition of launching London Fashion Week with a celebration of British Fashion at 10 Downing Street. welcomes designers to London Fashion Week opener. “The Government I lead will do everything we can, including providing the right investment in training and skills, to help everyone, whatever people’s backgrounds, to go as far as their talents can take them,” she said. The apprentices, from leading UK fashion businesses such as Charlotte Olympia and John Smedley, were joined by senior representatives from global retailers, media, and designer fashion brands. While the shows themselves are considered strictly industry-only, the British Fashion Council has put significant emphasis in recent seasons on opening up London Fashion Week to consumers and SS17 was no exception. A recent partnership with Ocean Outdoor allowed consumers to see the shows as they happened; live-streamed to 20 outdoor screens in Birmingham, Glasgow, Leeds, Liverpool, London, Manchester and Newcastle. Yet this accessibility does not come without its conundrums: traditionally fashion weeks showcase seasonal collections to press and buyers six months in advance of the clothes hitting the shopfloor. But with increased globalisation, the exponential growth of digital media and an impatient consumer used to next-day-delivery, this calendar no longer seems to be working. While clearly there is no more a ‘one-size-fits-all’ fix here than there is in body shape and garment sizes, some brands have made radical changes to find a solution. As mentioned, Burberry’s 83 ‘seasonless’ men’s and women’s looks were made immediately to buy, a concept being termed ‘see now, buy now’. 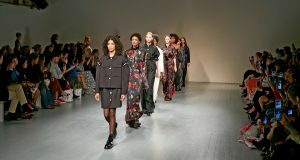 After these plans were announced in February 2016, numerous other LFW brands followed suit, including Oliver Spencer, Topshop Unique and Fyodor Golan. Each of their new collections have now been made available online and through physical retail channels. As the London Fashion Week events kicked off, the industry’s on-going plight of body image and unhealthy weight expectations was thrust into focus once again. Outside Brewer Street car park, seven ‘plus-size’ models staged a protest over the lack of size representation in runway shows and called for designers to stop making sample sizes limited to those below body ‘ideals’. The campaigners spoke out against what they call a ‘terrifying’ fixation with thinness that isn’t realistic or representative when the average UK woman wears a size 16. 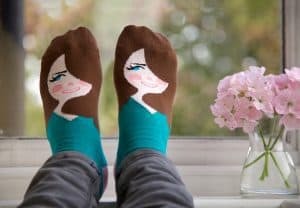 Simultaneously, the UK’s Women’s Equality Party (co-founded in 2015 by author and journalist Catherine Mayer and broadcaster and journalist Sandi Toksvig) launched an online campaign “#NoSizeFitsAll”. The movement encourages women to share images of themselves on social media, and to apply pressure on the British Fashion Council to respond to demands of better size diversity, with the aim of tackling negative body issues and eating disorders nationwide. The leader of the party, Sophie Walker, is touted to soon approach London Mayor Sadiq Khan with the request that if size representation has not radically improved by next season (February’s event) he should withdraw funding for London Fashion Week. Watch this space.